The experienced medical staff of Berks Eye Physicians & Surgeons in Wyomissing, PA, offers a wide array of eye care services. Whether you have been diagnosed with an eye disease and need evaluation and treatment, or you are seeking a comprehensive eye exam to determine the health of your eyes, our team has the training and expertise to provide optimal eye care. – Have you been diagnosed with a cataract? Our experienced cataract surgeons use the latest technology to provide the best visual outcomes after surgery. Learn your options to reduce or even eliminate your dependence on glasses after cataract surgery with the use of Advanced Technology Lenses. -As with many other diseases, certain individuals may be more at risk of developing glaucoma than others. During your glaucoma evaluation, your ophthalmologist will collect information to help determine your glaucoma risk factor profile. For more information, check out our glaucoma center. – Are your eyes itchy and irritated? You may have a very common disorder called Dry Eye Syndrome. There are many treatment options available to relieve your dry eyes. Call us for a personal evaluation. – Are you seeking clear vision without dependence on glasses or contact lenses? LASIK laser vision correction may be an option for you! We encourage you to read through our website or click here to familiarize yourself with the procedure and contact us to determine if you are a candidate for LASIK laser vision correction. If you would like to come in for a complimentary consultation, call us at 610-603-5557. – Are your eyes looking tired and droopy? Is it impacting your ability to see? There are procedures available that can improve your vision and give your eyes a fresher appearance! 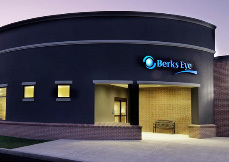 These are just a few of the services offered at Berks Eye Physicians & Surgeons. We are happy to provide for all of your eye care needs, including contact lenses and glasses. We encourage you to contact our office to set up an appointment today at 610-372-0712.